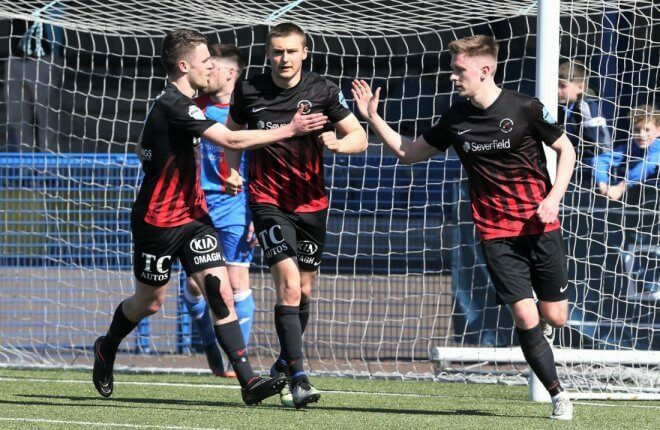 Few would have predicted it two months ago, but Ballinamallard are still standing and still swinging going into the last Saturday of the Premiership season. After last weekend’s games they are level on points with Carrick at the foot of the table. But with the Belfast side boasting a superior goal difference, -48 to Ballinamallard’s -53, the onus is on the Ferney Park men to dig out a big result against Glentoran this Saturday. They will still need Warrenpoint to either beat Carrick or keep them to a draw for the Fermanagh side to have any chance of grabbing the second from bottom relegation place. Nevertheless, the Ducks turnaround in form since Harry McConkey took the hot seat is the only reason Ballinamallard haven’t already made the drop. They have picked up ten points in their seven games since he took charge and that revival has given the Mallards a lifeline. Saturday’s trip to the Oval is another cup final and McConkey believes the all-or-nothing nature of games since he came in has had a positive galvanising effect which has brought the best out of the players. “The great thing for me is that we had eight games to go when I came in and for seven of them we have been in the situation where we have had to go into every game and get something out of it. “There has been a clear focus on the opposition and getting points. That hasn’t changed. To be going to the Oval on 28th April, a venue which has often hosted Irish Cup finals, I’ve told my players it’s an opportunity to have a great game at the end of the season in a great stadium, what a great game to be involved in. Playing into the general mood of positivity is a relatively clear sick bay in Ferney Park. Despite still playing with some jaw pain following his early exit with injury against Ards, Ross Taheny had an Irish Universities game in Cork midweek and should be in contention for selection on Saturday. Also available will be defender Michael Kerr. “Michael arrived to Ards from Iceland directly from the plane,” said McConkey. “He insisted on going out and doing the warm-up even though he wasn’t in the 16 which was lovely. He will be buzzing and is available this week which is a real plus. “Davy Kee is definitely out with a recurrence of the groin problem. We were surprised by his recovery on Thursday night and he felt he was fit enough to be involved again. Unfortunately he broke down in the game after just being on the pitch, which is disappointing for us and he now knows he needs to rest. In the background to the last Saturday of the Premiership is the narrative that some in Belfast would like to see Ballinamallard make the drop to ease travel costs. McConkey isn’t blind to that way of thinking, but insists the Mallards contribution to the top flight is something which is valued and which would be missed. Nevertheless Glentoran won’t be sentimental on Saturday and McConkey knows they will be coming out to finish a poor season by their standards on a high. If Ballinamallard are going to stay up, they’ll have to seize their fortune with their own hands. “Glentoran lost to Warrenpoint and kicked back by beating Dungannon Swifts. Ronnie McFaul was disappointed with their performance in Warrenpoint and they got a reaction against Dungannon Swifts. “They’ve gone and dipped again last Saturday. I know the Glentoran supporters and their manager were very disappointed with that, so I expect there will be a real backlash from that this Saturday. “When you put the two names on a sheet, Ballinamallard and Glentoran, it’s always going to be a big challenge for us. But we’re certainly not frightened of it and just hope that we are the hungrier team of the two on the day and we get the breaks.